Home / sport / Arsenal, Chelsea and Leicester City have reacted to Nigeria’s 1-0 win over Egypt on Tuesday. Arsenal, Chelsea and Leicester City have reacted to Nigeria’s 1-0 win over Egypt on Tuesday. The club monitored proceedings at the Stephen Keshi Stadium, Asaba, Delta State. Also Danish club, FC Midtjylland officially reacted to the Super Eagles win against the Pharoahs. Chelsea wrote on their official website, ”Kenneth Omeruo was an unused sub as Nigeria beat Egypt in a friendly. Arsenal, having two of their players on the pitch, wrote, ”Elneny and Iwobi then went on to face each other in a friendly on Tuesday night, with the latter coming out on top. 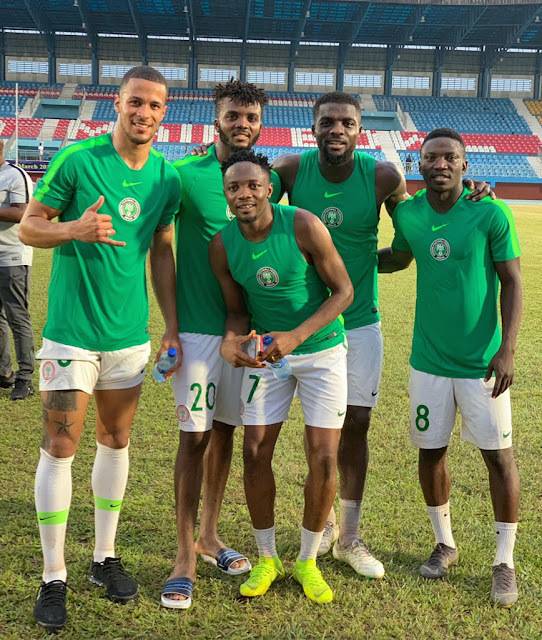 Leicester City wrote, ‘Wilfred Ndidi, who helped Nigeria overcome Seychelles on Friday, earned his 24th cap as the Super Eagles beat Egypt. Manchester United manager, Jose Mourinho has released a 25-man squad for the 2018/19 UEFA Champions League competition. CEO :Roffies Signature on "The Gist with sisi joke"
Cardiff City 2 Arsenal 3: Aubameyang-Lacazette combination sees off Warnock's battlers.